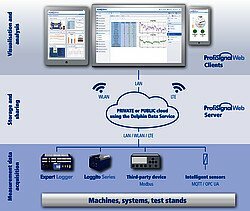 Delphin Technologies ProfiSignal Web provides a simple way to visualise complex processes and testing procedures via a web-based client server system that can run on any mobile device, in addition to desktop PCs and laptops. ProfiSignal Web uses modern graphics, intuitive operation and gives you the ability to turn your mobile device into a dashboard. With a large choice of display objects, you can adapt and combine items to create display screens tailored to your requirements. Range of interfaces - compatible with many intelligent sensors and third party measurement equipment, in addition to Delphin hardware. Decentralised acquisition and access to measurement data from any location, viewable on any type of user device. 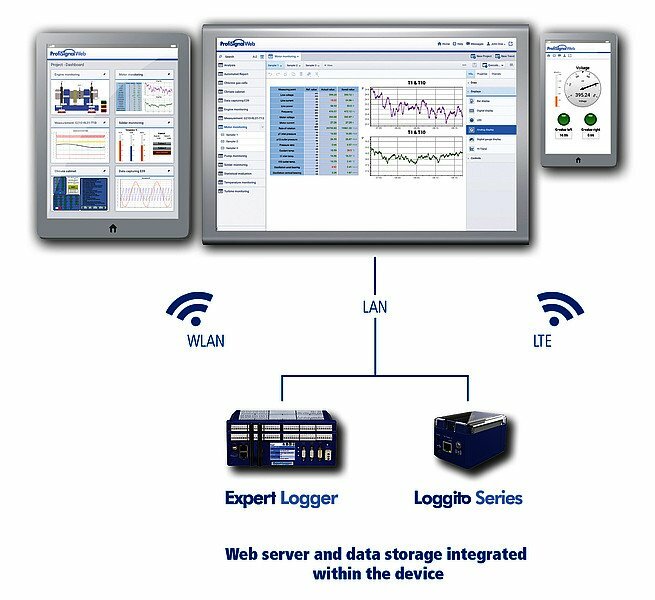 Connect to your data acquisition system directly using a smart phone or tablet as your dashboard. LogMessage devices are precision instruments that can be switched via software to function with any type of sensor.